Outfitted with a high performance motor and sleek design for fast speeds and great maneuvering capabilities. Create some cool summertime memories. 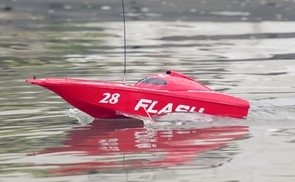 This new RC speed boat is highly detailed and makes for great fun on the water. Measuring almost 21 inches long and featuring authentic and stylish detailing, these remote control boats are perfect for pools, ponds, rivers, and lakes. Take this full function RC jet boat outside and have some fun on the water. Want more? Ok, buy today and we will upgrade you to a metal propeller! Arrives fully assembled with remote control, rechargeable battery pack for the boat, and charger. Special water cooling system keeps your motor cooler and running more efficiently. The dual propellers can be controlled from the dual joystick transmitter to provide top speeds with forward, left and right turning functions. Buy it all today for a great price. Order 2 of these RC speed boats and we will give you separate radio frequencies for dual racing boating fun. Reach speeds of about 20 mph and has an operating range of about 500 feet.